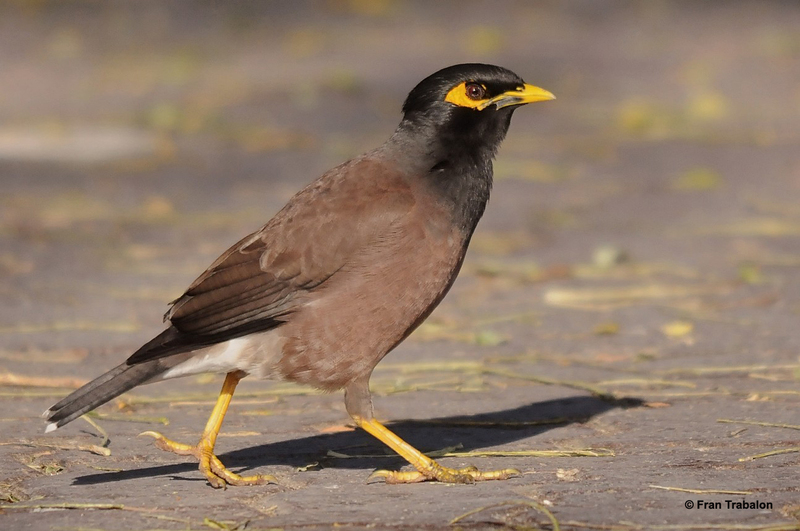 English: Indian myna, house myna, common mynah, locust starling, myna; French: Martin triste; German: Hirtenmaina; Spanish: Mainб Comъn. 9.1–9.8 in (23–25 cm); weight 2.9–5.0 oz (82–143 g). 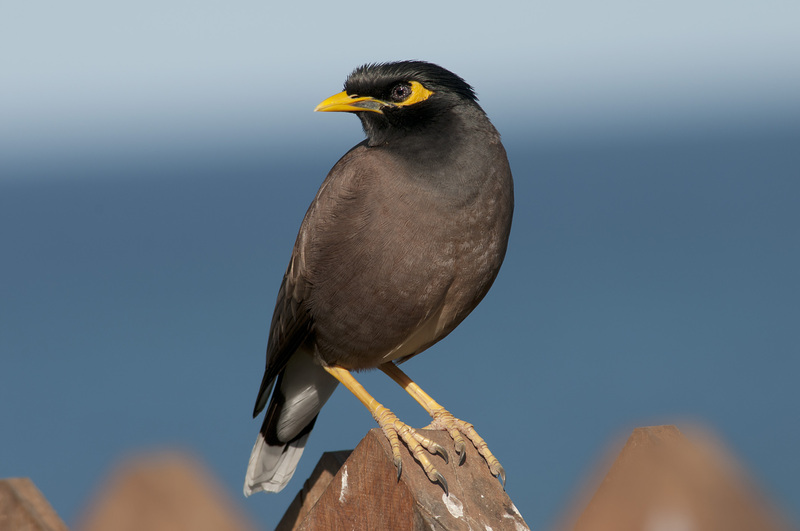 Sexes similar; a stocky, brown bird with a glossy black head and throat, yellow bill, bare yellow skin behind its eyes, and yellow legs; juveniles are duller. Lowlands to 4,500 ft (1,370 m) in southern Asia from southeastern Iran though Afghanistan, Pakistan, India, Sri Lanka, southern China, and Vietnam. Introduced and established in Arabia, South Africa, Madagascar, Australia, New Zealand, Fiji, Cook Islands, Society Islands, Hivaoa in the Marquesas Islands, and Hawaii (Midway and from Kauai east). An introduced breeding population on Kwajalein in the Marshall Islands died out. 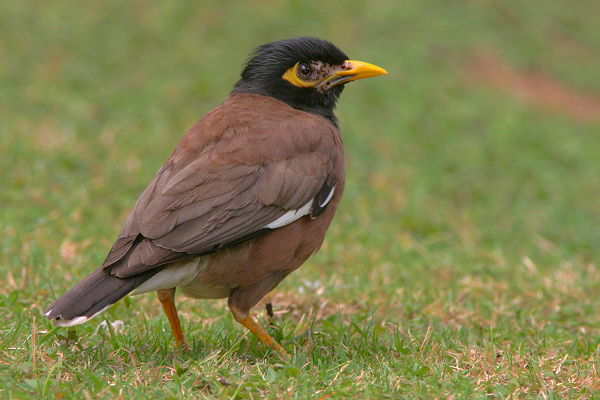 A. t. tristis, most of range; A. t. melanosternus, Sri Lanka. Open habitats including farmlands, cities. Tame, bold, and noisy; usually seen in pairs or small flocks. 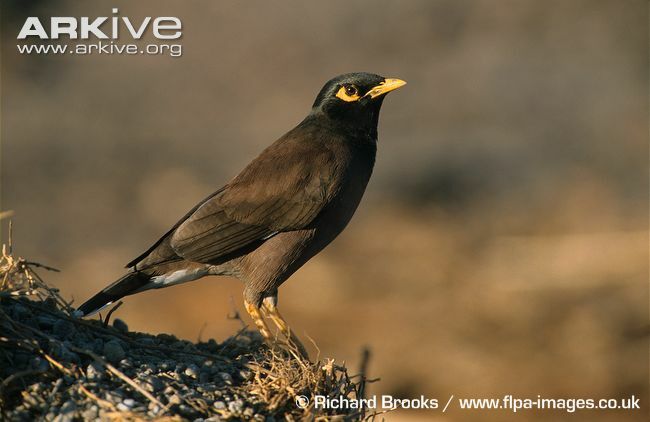 Feeds mainly on ground on insects, but takes small vertebrates, carrion, occasionally eggs and nestlings of other birds, fruit, and grain. Builds bulky nest in tree cavities, niches on buildings, and in dense vegetation. Clutch of four to five glossy, pale blue eggs is incubated by both parents for 13–18 days; young leave the nest as early as 22 days, but may not be able to fly for another week or more. 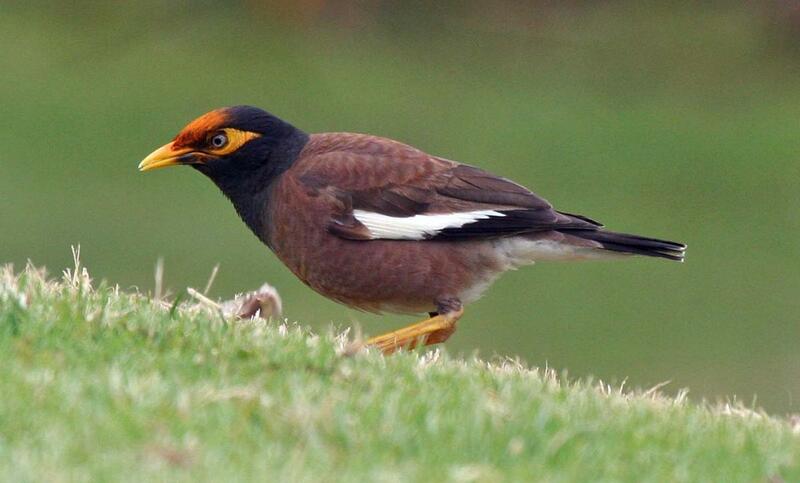 Considered a pest in Australia where noisy winter roosts of several thousand can occupy city trees and buildings, and also a pest in many areas where it seasonally may take grain or fruit.